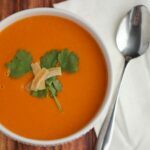 Thai Coconut Butternut Squash Soup + Kenmore Pro Heavy Duty Professional Blender Giveaway - Frugal Mom Eh! I’ve been using a high-end professional blender for a few years now and I am still in love with it and use it constantly. So when Sears Canada reached out to me to check out the new Kenmore Pro Heavy Duty Professional Blender, I was a little hesitant. I don’t really like setting myself up for having to write a negative review and I felt like one would probably be coming. I mean, how does one compare a $700 blender to one that is only $149.97? Well I put away my Blendtec over past two weeks and I’ve been testing out the Kenmore Pro Heavy Duty Professional Blender to find out. The Kenmore Pro by Sears actually surprised me in the end. It offers almost everything my high end blender does but at a fraction of the cost. It has a 2L capacity BPA-free container like my high end blender, which is great when making soup. There is no sorting out how to blend in batches, it will likely all fit! It is powered by a 1.95 hp engine and 6 japanese-made blades that allow you to blend, chop, churn, cream and grind. 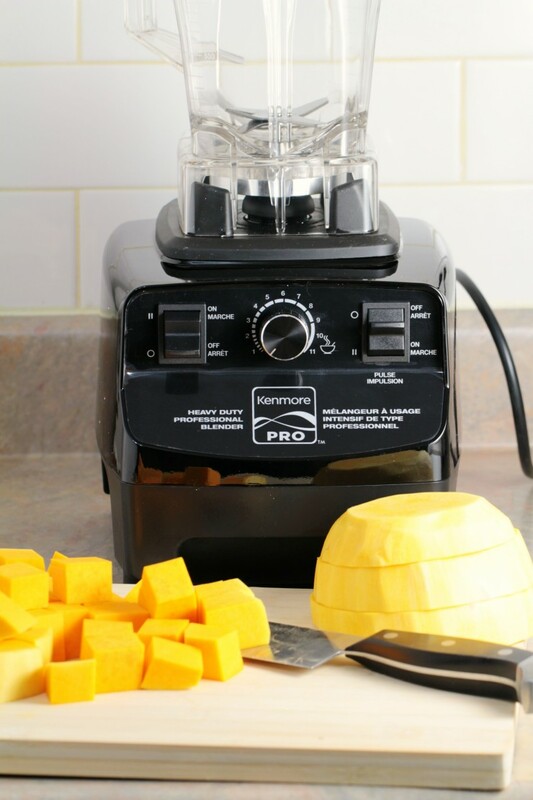 Not to mention it can easily handle chopping and crushing ice (hello smoothies!) Now the engine is less powerful than my high end blender but honestly, you would never know based on performance. My soup came out every bit as smooth and creamy as it does when I make it with my other blender. The only thing missing, for me, is that there are no pre-programmed settings and the controls aren’t touch-screen. To be fair though, the Kenmore Pro Heavy Duty Professional Blender was designed to be comparable with the Vitamix and I think the controls are very similar to what you would find on a Vitamix. It’s also capable of 11 speeds with a separate pulse switch. On the other hand, I found a feature on this blender that I wish my blender had – a built in cord storage system under the base! I mean honestly, it is such a simple thing but it makes storage so much more organised. It’s a seriously smart feature! Being a professional blender, it is large, heavy and fairly loud but that is consistent with other high-end professional style blenders. There is even a speed setting for heating up food as it blends which is actually a really useful feature. 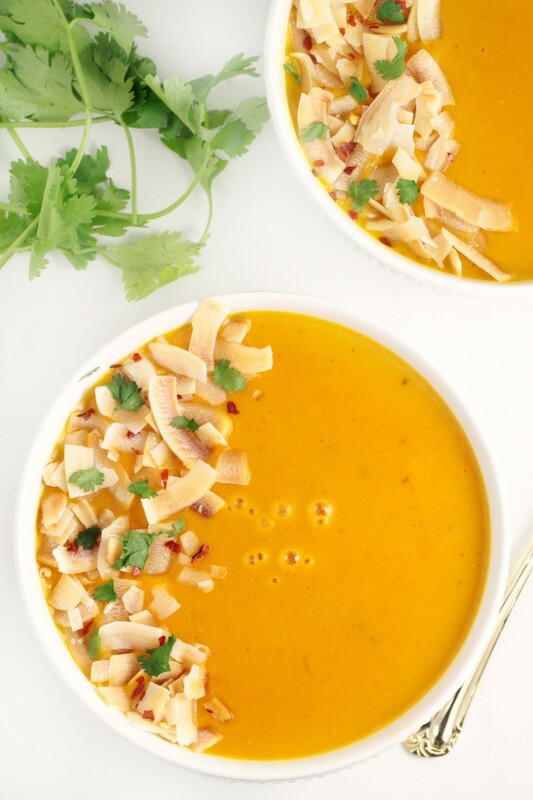 It’s great for making hot soups in just minutes. I was also pleased with all the built in safety features found on the Kenmore Pro Heavy Duty Professional Blender like rubber feet to stabilize, overheat/overcurrent protection, a soft start motor and a safety switch. 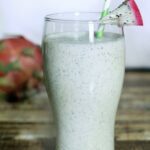 Overall, I am very pleased with the Kenmore Pro Heavy Duty Professional Blender and would definitely recommend it to anyone looking for a high-end blender. Especially for those who cannot quite stomach the price points of a Vitamix or Blendtec blender. 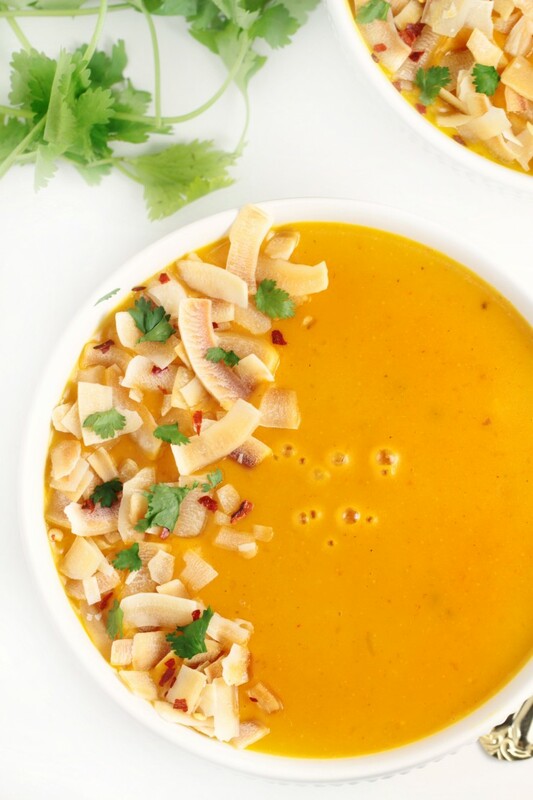 A curried, creamy butternut squash soup made with Thai inspired ingredients like ginger, coconut and lemongrass. 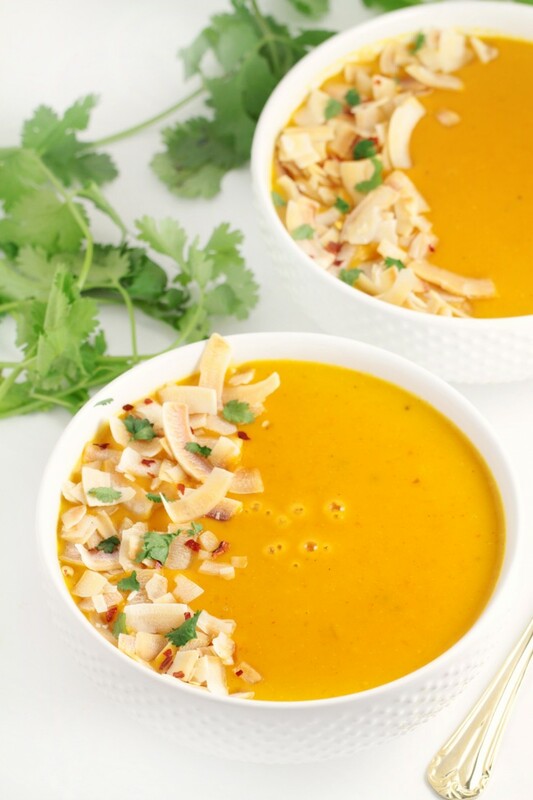 This Thai Coconut Butternut Squash Soup then gets topped off with toasted coconut and cilantro for an amazing finish. Add squash, onion, garlic, curry paste, ginger, salt, pepper flakes, fish sauce, and lemongrass. Stir to combine and cook until onion starts to soften. Add broth and bring to a boil. 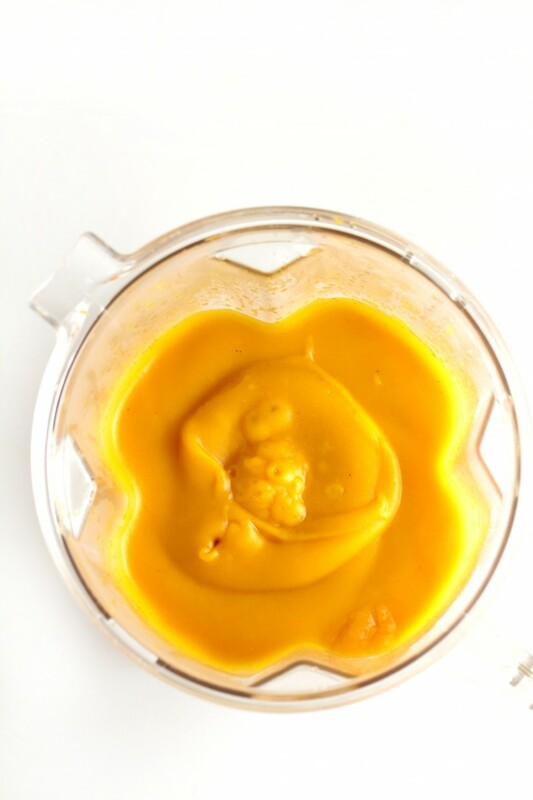 Reduce heat and simmer until the squash is soft, about 15 minutes. Remove from heat and transfer to Kenmore Pro Heavy Duty Professional Blender, first discarding the lemongrass pieces, to blend on medium speed until smooth. Transfer back to the pot and stir in coconut milk and lime juice, bringing the pot back to a simmer over medium-low heat. 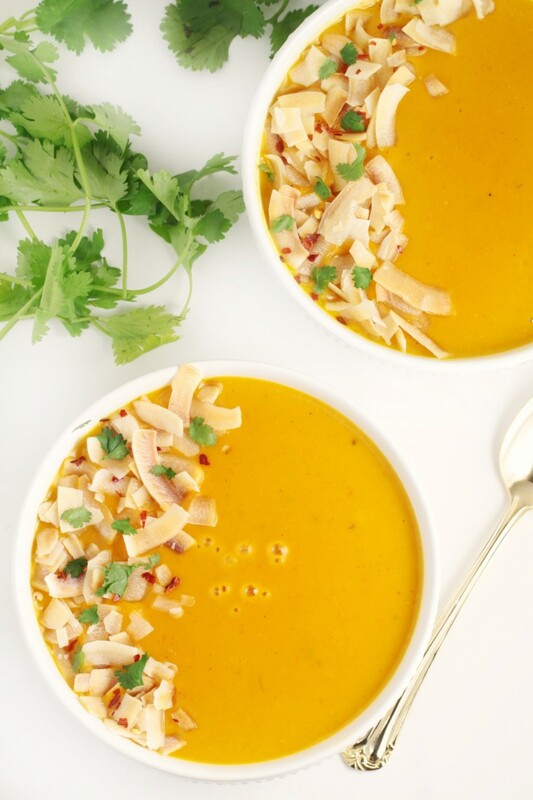 Serve hot topped with cilantro, coconut flakes and red pepper flakes. Canadian residents 18+ (excluding Quebec). See Giveaway Tools form for entry and T&C. Disclosure: This post has been brought to you by Sears Canada. All thoughts and opinions are honest and my own. I learned that it has a overheat reset button, like that as a safety feature. Looks like a great blender. I learned that it comes with a recipe book. Happy to learn it has a 1 year warranty! I like that it had an overheat reset button and a safety switch. Also that they had 11 different speeds. It has a 2 litre capacity! That would be great for my borscht batch! Based on the look of this I am fairly sure it is a re-branded Vitamix. Good price if it is. I like that it features a safety switch and an overheat reset button. The soup sounds so good! Pinned to save and share. Wish the giveaway was open to US residents, too. I learned that it has eleven speeds for great processing. I sure could use this blender. Sounds wonderful. Love the safety switch and the 11 speeds. That makes it easy to mix up anything. I learned that it holds 2L, and is $150. I learned it has a BPA free container. I like how it has 11 different speeds. I learned that the 6 blades are made of stainless steel and are made in Japan! KenmorePro Blender has stainless steel blazes and 11 different speeds. I learned that it has a BPA free container. I love the fact that it has safety switch and an overheat reset button for those “forgetful” days. I like that it hold 2 L and has stainless steel blades. I learned that the blender has the BPA free container, safety switch, and an overheat reset button. I learned that it has a 2 l capacity which will be more than enough space for me to make healthy smoothies. I learned the KenmorePro. has 11 speeds. This would be perfect for my daughter in law. I like the look of those serrated blades! I’ll bet they could handle just about anything put into the blender. I like that the KenmorePro has eleven speed settings. I learned it has 6 stainless steel rotating blades made in Japan. I learned that it has 11 different speeds. I love that it has the overheat safety switch! I learned that it has an awesome 11 speed option! Thanks! I like that it has Variable speed dial, with your choice of 11 different speeds and that it has a 2L capacity. I love that there are 11 speeds and not a whole lot of buttons to make things confusing! Just all in one dial. 2L capacity is amazing too! I like that it’s Heavy Duty as I already killed 2 supposedly good blenders. I like that this blender has 11 different speeds. That’s handy for making all kinds of things! I learned it has a variable speed dial with 11 different speeds. I learned that the blender has the BPA free container and it has overheat reset button. I love coconut in soups. 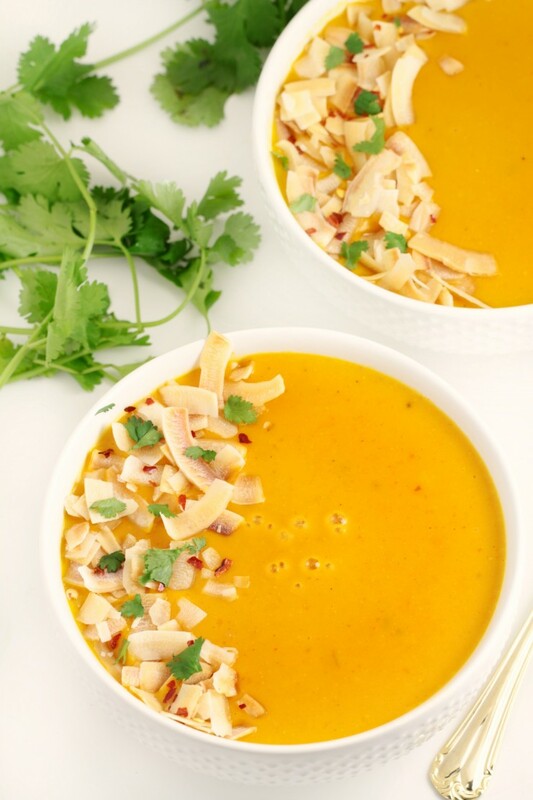 Nicest soup I ever had was a sweet potato and coconut soup. 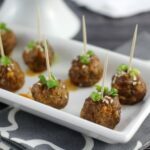 I have to find the recipe and try to make it myself. That it has a BPA free container. I like the big jug and the 6 stainless steel rotating blades. I learned that it has a large jug and an overheat reset button. I learned that the container is BPA free. The BPA free container is good. I learned about the speed setting for heating up food as it blends is an awesome edition to a blender! I like that it has 11 different speeds to choose from. I like that it has a storage system for the cord. I usually wrap cords around appliances to get them out of the way but a storage place is so much easier. I learnt that it has a 1 year warranty! I learned that it has 11 speeds. I learned it has a BPA free container. That’s awesome. I learned that it has a variable speed dial with eleven different speeds. Wow. And I love the easy clean up too. Amazing blender. I learned it has 11 speeds and 6 steel blades. Ilearned it had 11 different speeds. I learnt that it heats as it blends and can’t over heat. 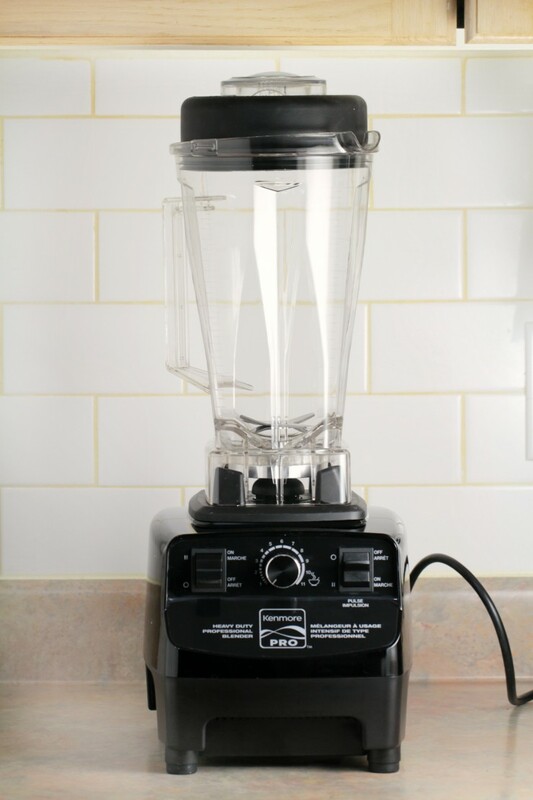 Nice to know that this blender is comparable to the Vitamix, but without the heavy price tag! We use our blender at least once per day, so we need a good one. I learned that it has 11 different speeds and is so reasonably priced! and also has a safety switch.This one is awesome!! I learned it has 6 blades made of stainless steel! Oh I love that it has a 2 litre capacity. I love that it has 11 speeds and has an overheat reset button! I learned that it has eleven speeds for great processing every time. I love that this blender has a 2 L capacity! I see it has 11 speeds , thats a lot ! I like that it is heavy duty, so will not have a problem blending frozen fruit like my current blender does! I like that it is heavy duty and has 11 speeds also large.! I learned about the safety feature of having and overheat reset button. It has 6 blades,double what my current one has! Oh boy, this is one amazing blender! I really got excited reading about it. I love that this has a 2L capacity. This means I can make the whole family smoothies in one go vs doing them all individually like I am right now. 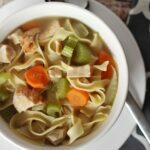 I also love that this would help me hide veggies in soups, stews and sauces to get the good nutrients my picky eaters need that they avoid like the plague. Thanks so much for the chance to win! I like that it features 11 different speeds & has cord storage. I’ve heard great things about this blender, for it’s price-point it is one powerful machine! I love that I can take the speed up to 11, not just 10, but ELEVEN!!!!! I learned that you can grind spices with the Kenmore Pro Heavy Duty Professional blender. I learned it has a variable speed dial, with your choice of 11 different speeds! Making soups in this would be amazing! I’m needing a new blender. Mine has a plastic hub that is starting to crack. I have a toothless poodle that I rescued and I blend food for him to eat so this would be awesome. I’d also like to start making some healthy smoothies for myself. My current blender doesn’t do a good job of those at and this one looks perfect! What I like is that it is powerful, has a tamper and has a variable speed dial which would allow me to control the texture of what I a m blending. Thanks so much for the review of this blender, your yummy recipe and the opportunity to win this awesome prize! I learned the blender has rubber feet for stabilizing. I learned it has safety features like an overheat reset button! I like that you can heat soup in it too, That blew me away. I don’t have any sort of a fancy blender so I don’t know what they’re capable of. There are 11 speeds for greater processing. This blender looks amazing, I like that it has a 2L capacity and has 11 speeds. This would be such a versatile tool to have in my kitchen! 11 speeds is quite impressive! This is the blender for me! 11 SPEEDS LOVE TO HAVE THIS UNDER MY X-MAS TREE!!! I learned that it is great for making soups and sauces with its 11 different speeds. Great that it has a cord storage system!